Abcam’s TNF-alpha in vitro SimpleStep ELISA® (Enzyme-Linked Immunosorbent Assay) kit is designed for the quantitative measurement of TNF-alpha protein in Human serum, plasma and culture media. TNF-alpha, also known as cachectin or TNFSF1A, is the prototypic ligand of the TNF superfamily which plays a central role in inflammation, apoptosis, proliferation, invasion, angiogenesis, metastasis and morphogenesis. It is expressed on macrophages, endothelial, epithelial and tumor cells as a 26kDa transmembrane protein. TNF-alpha is cleaved by proteolytic processing into six chains: (1) TNF membrane form, (2) Intracellular domain 1, (3) Intracellular domain 2, (4) C-domain 1, (5) C-domain 2 and (6) TNF soluble form. Signaling from TNF-alpha differs depending on the type of ligand initiating the signaling event (intracellular, membrane or soluble). As an example, the membrane form of TNF-alpha appears to mediate anti-tumorigenic therapeutic responses whereas the soluble ligand is linked to inflammation and proliferation. Our Abpromise guarantee covers the use of ab181421 in the following tested applications. Specificity of TNF-alpha signal on stimulated and non stimulated media supernatants. Human PBMCs were cultured in RPMI supplemented with 10% fetal calf serum, 2mM L-glutamine, 100 U/mL penicillin and 100 µg/mL streptomycin. Cells were cultured for 2 days at 37°C in the presence or absence of PHA. The concentrations of TNF-alpha were interpolated from the calibration curve and corrected for sample dilution. 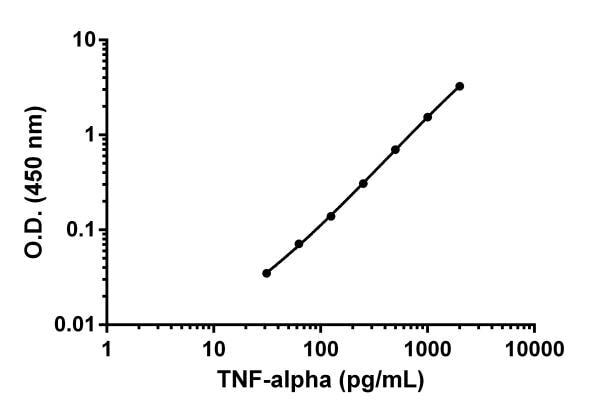 The mean TNF-alpha concentration was determined to be undetectable in basal media, 1.2 ng/mL in unstimulated PMBC supernatants and 4.7 ng/mL in stimulated PBMC supernatants. Publishing research using ab181421? Please let us know so that we can cite the reference in this datasheet. I used this kit to detect TNF-a in stimulated human CD14+ monocytes. The assay was extremely efficient. There is no overnight coating step, and detection/capture antibodies are added as a cocktail at the same time as the samples. The assay was quite accurate, detecting even minimal amounts of TNF-a. I would use this assay again for its efficiency, requiring very little time at the bench.